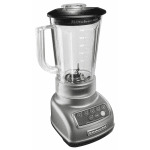 This 56 ounce blender from KitchenAid has a five-speed control, and the keypad is illuminated by blue LED lights. This blender uses an Intelli-Speed™ motor to adjust the blade speed based on the thickness of the items being blended. The steel coupler with 12 interlocking teeth transfers power efficiently to the blade.